Researchers: Andrea Donnellan, Jet Propulsion Laboratory and University of Southern California; Jay W. Parker and Scott Hensley, Jet Propulsion Laboratory; Lisa Grant Ludwig, University of California, Irvine; John B. Rundle, University of California, Davis; Jun Wang and Marlon Pierce, Indiana University; and Geoffrey Blewitt, University of Nevada, Reno. 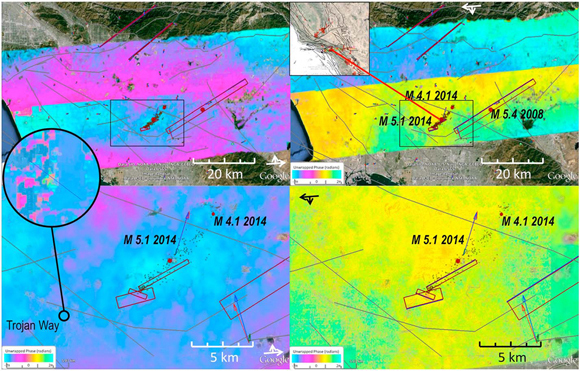 An analysis of geodetic and airborne UAVSAR imagery related to the 2014 M5.1 La Habra earthquake shows that the Los Angeles metro area consists of a complex system of shallow faults that tend to move together during an earthquake. The system is compressing the region along a north-south direction and squeezing a piece of the Los Angeles basin out to the west. The area shows stored potential of a M6.1–6.3 earthquake using the assumption that the shallow structures released accumulated strain that has not been released on deeper locked structures. The 28 March 2014 M5.1 La Habra earthquake was an oblique left-lateral thrust fault event that damaged water lines, one gas line and offset some sidewalk curbs. The average daily motion of 49 GPS stations within a 50 kilometer radius of the epicenter were analyzed for 15 days before the event and 14 days after the event to determine the motion along the fault during the earthquake. The stations are part of the EarthScope’s PBO (operated by UNAVCO), IGS, SCIGN, and SOPAC. NASA’s Uninhabited Aerial Vehicle Synthetic Aperture Radar (UAVSAR) measurements have been made on a regular basis in the region before and after the earthquake and provide information about the deformation process. The GPS displacements caused by the earthquake show north-south compression and a westward band of extrusion. The UAVSAR data show uplift above the epicenter, aseismic slip to the south and a small amount of shortening. Field observations of damage are consistent with these motions. Together the data indicate that this system of faults moves together during a medium to large event and that the motion is consistent with the regional tectonics. The analysis also shows that not all of the built up strain has been released by recent events and there is a deficit of earthquakes around La Habra. Using a Weibull distribution, the authors estimate a 99.9 percent chance of a magnitude 5 or larger event within the next 3 years within a 100-kilometer radius of the La Habra epicenter. Donnellan, A., L. Grant Ludwig, J.W. Parker, J. B. Rundle, J. Wang, M. Pierce, G. Blewitt, and S. Hensley (2015), Potential for a large earthquake near Los Angeles inferred from the 2014 La Habra earthquake, Earth and Space Science, 2, doi:10.1002/2015EA000113.